If you already know the value in choosing a convertible car seat or even crib, then you probably know how convenient it is to also invest in a high chair that can be used for more than one reason and for longer than just the infant stage. In this case, it’s the Skip Hop Tuo Convertible High Chair vs. the ZOE 5-In-1 High Chair, which are both designed to do more than simply give your baby a place to eat along with the family. For some, a high chair isn’t even necessary until your baby is old and developed enough to sit up in the high chair on his or her own. But once they’re also to do that and sit unassisted, these high chairs are easily used for your baby and eventually your toddler too. But unlike some other convertible baby supplies, the Skip Hop Tuo Convertible and the ZOE 5-In-1 both do more than provide your child with an eating space so that he or she can sit at the kitchen or dining room table too. As to be expected, there are some big differences, like the fact that the Skip Hop Tuo has a sleek and modern look that you may not even know is an option until you’ve seen it. On the other hand, the ZOE 5-In-1 is also nice to look at but can seem a little intimidating or bulky, given all of its functions in one. Then again, the ZOE 5-In-1 is also considerably less expensive than the Skip Hop Tuo. So, there are some areas where you take the good with the not so good, depending on which high chair you choose between the Skip Hop Tuo Convertible vs. the ZOE 5-In-1. The Skip Hop Tuo Convertible High Chairmight not look like your typical high chair that turns into a booster seat or something else for your child to use, but it can be used from infancy all the way up to five years of age. This means that you’ll get to bypass any booster seat stage for your dining chairs in your home and you won’t have to worry about hiding some large plastic seat when the company comes over. The Skip Hop Tuo Convertible High Chair starts off as a typical, yet modern looking, high chair with a five-point harness to keep your baby safe and secure. Additionally, it can be transformed into a toddler chair which can be used from 3-5 years old for your toddler. The toddler chair can then be used at any toddler-sized table, so it isn’t tall enough to slide into place at your kitchen or dining table, but it does offer a whole other use for the high chair after your baby has grown out of it. But, if you’d rather have your baby eat at the table in the high chair, you can quickly remove the tray to make that happen. Even before your child is at the stage to convert the high chair to toddler chair. Plus, the footrest helps your growing child stay comfortable as they get older and taller. Other Uses: After using the Skip Hop Tuo Convertible as a high chair for your baby, you can then convert it to a shorter toddler chair for your child that they can continue to use for quite a while. Cleaning: The seat pad can be wiped clean and is even reversible so that you can get used out of one side after you’ve wiped down the other. Child Age Range: As a high chair, your baby can use it from 6 months-3 years of age and then as a toddler seat from 3-5 years old. Price: On Amazon, the Skip Hop Tuo Convertible High Chair is $160. Check out the latest price! Where To Buy: You can find the high chair on the manufacturer’s website and Amazon or in-store at Macy’s and Buy Buy Baby. Even if your baby can’t quite sit up that well, the harness in the seat will help him, or she stays securely buckled in the seat. Since it has a sleek and modern design, the high chair should fit in with most house decor. Although it doesn’t convert to a booster seat of any kind, the Skip Hop Tuo Convertible High Chair does have the option of being used as an adorable toddler chair that can have many uses on its own. It’s also relatively easy to put together, which can be more than convenient, especially as some other convertible high chairs are a lot more complicated. You can’t fold up the high chair for storage, so it will need to stay out at all times. Since it can only be converted to one other use, you may need to also buy a separate booster seat for your dining or kitchen chairs, especially if your child outgrows the high chair seating earlier on. It can be awkward and difficult to slide the removable tray in and out. “After getting it, I am very pleased. It’s so cute; it’s modern and simple. But yet it turns into a chair for when she older. We love it. My daughter can’t sit up very well yet, but the harness helps her to sit right.” – Courtney Cmoney Chapman on Amazon. “We got it couple of days ago; my little one is five months… I can put her and her toys, so I can be hands-free for a while. As well I love that fact that is convertible, so it extends its worth.” – Agne on Amazon. “It was fairly easy to put together and seems very sturdy the legs are made of wood and twist into each other… The chair is a little smaller than other high chairs, but overall looks great! I couldn’t talk myself into buying one of the fabric high chairs that to me are just an eyesore.” – Sarah on Amazon. The ZOE High Chair 5-in-1 may not be as aesthetically pleasing as the Skip Hop Tuo Convertible High Chair but it does have a ton of functions. 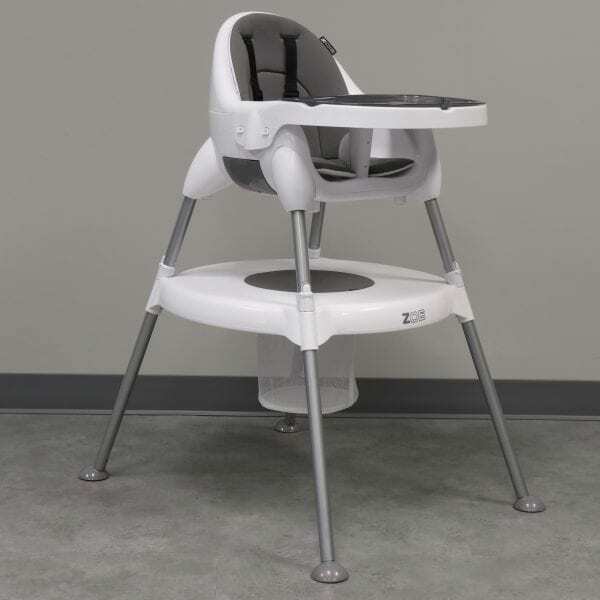 In addition to being used as an actual high chair with safety straps, it can be converted to a lower chair with attached tray, floor seat with tray for either eating or playing on the tray, a portable booster seat for dining chairs, and a mini table and chair. 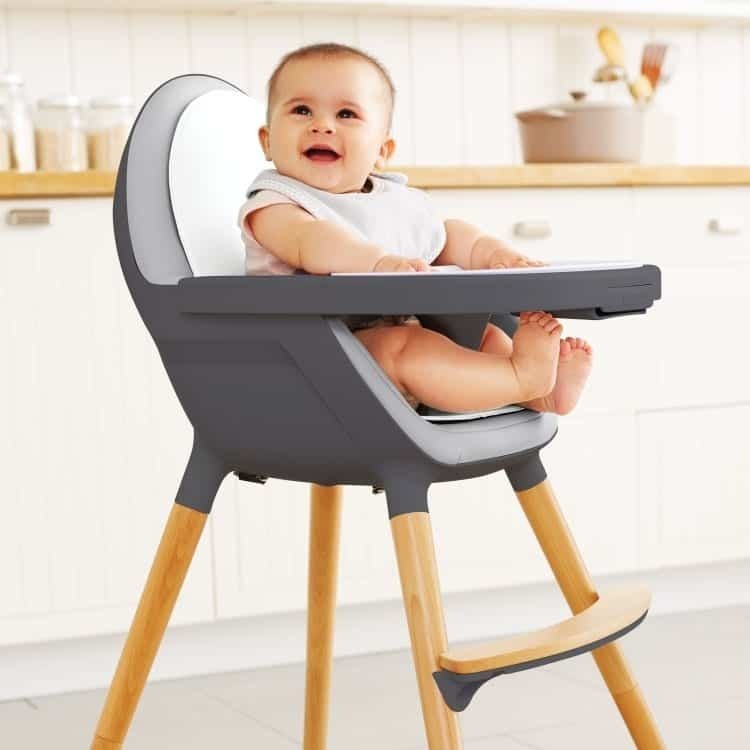 There’s no shortage of ways to use the ZOE High Chair 5-in-1 High Chair for your baby and then your toddler, so you can get used out of it in so many different ways. When you use it as a high chair or indeed with the legs period, you can be sure that it won’t slide around thanks to its anti-skid pads on the bottom of the feet. And when its used as a portable booster seat, you can use the handle on the back, or even hang the tray on the back of the seat when neither are in use. Like the Skip Hop Tuo, you won’t be able to fold it up to store it away when it’s not in use, but when it’s being used as a booster seat or toddler chair and mini table, you won’t need to anyway. You can even buy a travel bag separately or purchase just the toddler-sized chair separately, so you have an extra one for your child once they outgrow the high chair and are ready for that transition. Other Uses: You can use it as a high chair, toddler chair, toddler chair and small table, portable booster seat, or floor seat with the tray still attached for eating or playing. Cleaning: You can remove the seat cover to clean in the washer and then wipe down the chair and the tray to clean them both. Child Age Range: The high chair is suitable for babies from the time they can hold their head up on their own and then transition to the booster and toddler chair at roughly three years old. Price: On Amazon, the ZOE 5-In-1 High Chair is $100. Check out the latest price! Where To Buy: You can find the high chair on either the manufacturer’s website or on Amazon. There are so many different uses for the high chair that your toddler can even use it after they’ve used it as a high chair or booster seat. You can buy an additional toddler chair to go with the toddler chair and small table, so your child can have fun with it for years to come. The padding on the seat is comfortable and thick enough to provide soft cushion without overheating your child. There’s a storage compartment for the safety straps and even a storage area in the center of the table when you transition to that stage of the high chair. Although the tray can be removed, it can be difficult to span on into place each time. When you use it as a high chair, it can be somewhat bulky, especially as the bottom is so wide. You can wipe down the high chair and put the seat cover in a washing machine, but the straps can be difficult to remove and clean. “This table & chair set is wonderful & very versatile! My grandchildren love the comfortable chairs & the table has a mesh storage basket with a round cover on it so the children can store their special toys in it. Also, we love the color & the flexibility & ease of turning it into a booster seat/high chair!” – Kathy Carver on Amazon. “First, the fact that it can be used as a high chair, table, and chair, chair, or booster seat is awesome. Second, even though it looks a bit cheap and is made out of lightweight plastic and aluminum(? ), it is built quite well and seems to be very sturdy. Third, it was super simple to put together. Love that! Fourth, the harness is great and seems to keep my child in the chair safely. Even if the tray were to come off, the child would be 100% safe if you buckled them incorrectly.” – Christell Lee on Amazon. “I was pleasantly surprised at how durable and comfortable this highchair is. The seat is well padded and gives the chair a spaceship look/feel. Super cute and stylish.” – Amira W. on Amazon. Overall, both the Skip Hop Tuo and the ZOE 5-In-1 High Chair offer plenty regarding versatility. But it’s hard to ignore the many different things the ZOE 5-In-1 can do versus the two different possibilities of the Skip Hop Tuo. The ZOE is also less expensive than the Skip Hop Tuo, which can sometimes be enough of a deciding factor all on its own. And even though the Skip Hop Tuo is a lot more pleasing to the eye thanks to its modern design and less bulky plastic parts, the ZOE can do so much and offer literal years of use for not only cute little toddler seating, but also booster seating at your kitchen table. It’s also just $100, which is plenty affordable for all it can do all that it offers. Not only that, but you can legitimately take the booster seat along with you places, whereas with the Skip Hop Tuo, there’s nothing portable about it, even once it’s converted from a high chair. Any way you look at it, buying a convertible high chair will be useful for your child in the long run. It will also, in most case, mean less spending for you over the tie, which is, of course, another big plus. When it comes to the Skip Hop Tuo Convertible vs. the ZOE 5-In-1, however, the proof is in the chair that does it all and then some. Both offer plenty for your baby and eventually your toddler to be able to enjoy and get use out of them. The most reliable option, though, is going to be the ZOE 5-In-1 High Chair for your baby to use until they’re old enough to utilize it as a little table and chair too.